One of the pre-eminent painters of the Post-Impressionist period Louis Valtat painted in an expressive style, a Van Gogh-influenced variety of Post-Impressionism, as opposed to the more decorative style of Bonnard and Matisse. 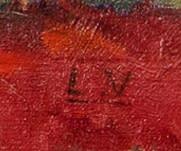 His early work is hailed for its vivid colors and expressive use of thick paint. Valtat is regarded as one of the leading proponents of Fauvism, a movement that extolled the virtues of strong colors and distinctive painterly qualities over overt realism and naturalism. The colors remain expressive, although not strident, while the meticulously balanced scene retains a simplicity as well as an abstraction or flattening of the canvas with echoes to Post Impressionist restraint. The result is an extremely pleasing, vibrant, and well-balanced composition that showcases the artist's uncanny ability to create a unique space filled with light through his personal and particular choice and application of color. Louis Valtat is known as one of the leaders and founders of the Fauvist movement, which did not formally begin until 1905 at the Salon d'Automne. Born in 1869, Valtat moved to Paris at the age of 17 to study at the École des Beaux Arts under Boulanger, Lefebvre and Constant. He was involved with the most influential groups of artists who numbered such as Renoir, Signac, d'Espagnat, and Luce, and exhibited widely throughout his career. Louis Valtat completed Vase de Roses in 1938 when he was living in Choisel, a small village in the Chevreuse Valley where he spent the major part of the year. Valtat executed a number of still lifes during this year, but our example is truly an exceptional one, a masterpiece. Valtat is regarded as one of the leading proponents of Fauvism, a relatively short-lived but nonetheless important movement at the beginning of the twentieth century which extolled the virtues of strong colors and distinctive painterly qualities over the representations and realism of Impressionism. 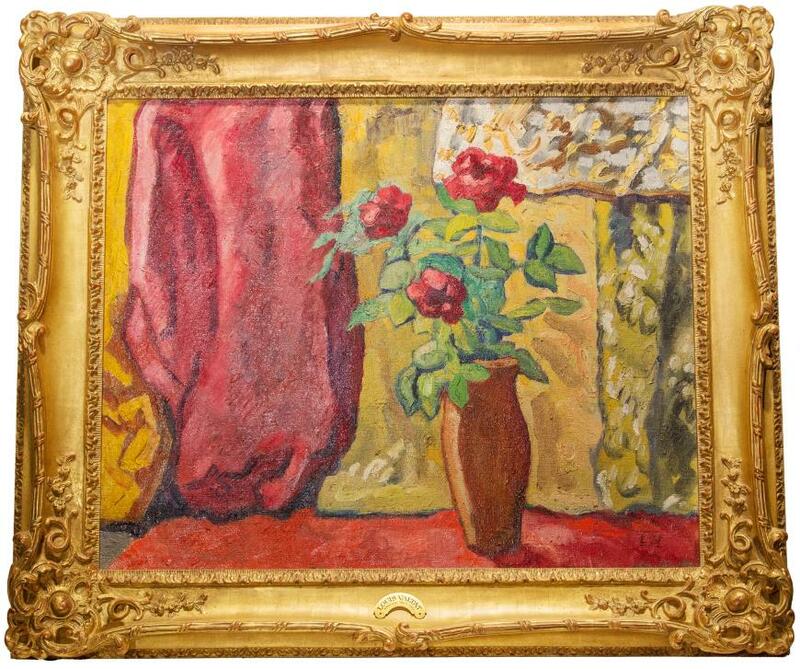 The residual influences and overtones of this movement can still be seen in this glorious, large, and extremely important still life of vivid red roses perhaps freshly picked from his own garden. These rich blooms are contrasted against brilliant green leaves set in a simple earthen vase atop a red draped tablecloth that sits at right angles to an equally intense pinkish red drapery. The colors remain expressive, although not strident, while the meticulously balanced scene retains a simplicity as well as an abstraction or flattening of the canvas with echoes to Post Impressionist restraint. 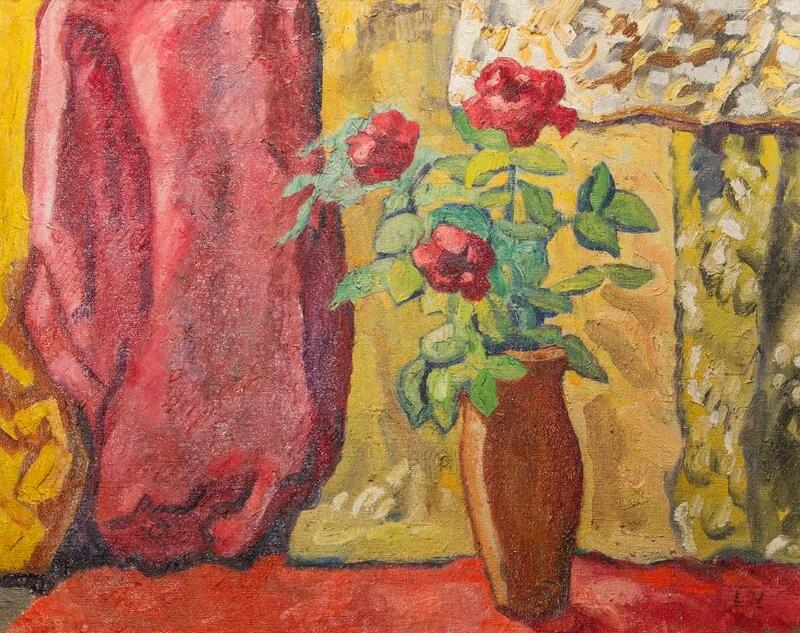 The result is an extremely pleasing, vibrant, and well-balanced still life that showcases the artist’s uncanny ability to create a unique space filled with light through his personal and particular choice and application of color.